To enhance each Sunday's Epistle and Gospel we present this special feature provided by John Gregory with the Haydock Commentary found at the bottom of each page of the Douay-Rheims Bible. We publish it here in conjunction with the Epistle and Gospel for the Sunday Mass, with the cogent comprehensive Catholic Commentary penned by Father George Leo Haydock. Today for the Fourth Sunday after Pentecost, the theme is those creatures swimming in the sea of fallen human nature in this world and who can only be rescued through the grace of God via those He has sent to reel in souls as fishers of men. St. Peter is the chief fishermen and, despite his temerity, our Lord knew the mettle of the man He tabbed to head His Church on earth and had no compunction in commanding His disciples to "launch out into the deep" for souls, not fish as we see in Fr. Haydock's Commentary for the Fourth Sunday after Pentecost, "Launch out into the deep, and let down your nets..."
John Gregory has provided the Haydock Commentary for Trinity Sunday in which Christ reaffirms His short, but powerfully poignant and pertinent words in His final assurance of His protection for all time. In today's Gospel we have all we need to debunk all Protestant argumentation for Scriptura sola or Fidei sola. Their rationalizations are heresy for the Word alone will not save you, nor will Faith alone, but rather those combined through the Sacraments for only through being in the state of Sanctifying Grace can we hope to achieve Heaven. We arrive at the sacraments through Faith and we learn Faith through the Word. Consider, if you will, a three-legged stool (ideal analogy for Trinity Sunday). If one of those legs are missing the stool cannot stand. To know Jesus is to love Him and obey Him by following all He commands. 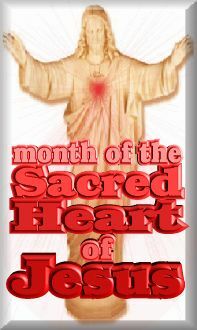 For the Haydock Commentary of Trinity Sunday's Epistle and Gospel, see "Behold I am with you all days"
On 'Red Easter', when we celebrated the birthday of the Church there is another church trying to horn in on our festivities. And editor Michael Cain doesn't mind relating how much he resents it for it has swallowed up a very good priest in Fr. Al Svobodny, OMI, another victim of the conciliar freezer. 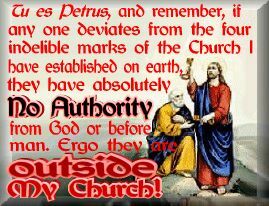 Oh, the conciliar church might be called 'Catholic' but it has none of the similarities of what the universal Church exhibits such as One, Holy, Catholic and Apostolic. Those indelible marks, infallible attributes of the Church Christ founded upon the Rock of Peter, are absent as the Modernist Mengales strive to alter the truth, creating their own evolving monsters in the Modernist mold that consistently ignores the fact that the Author of Truth has revealed all things and there is really nothing new under the sun for the Son, Father or Holy Ghost. They can neither deceive nor be deceived. That should tell you everything about those who do deceive. We only wish there weren't such a casualty list of those who have been deceived, including our former spiritual director who is trapped in the syncretic system that has sapped so many religious orders that used to be valuable to saving souls. Sadly, that is the case no longer as hearts harden and the faith freezes over faster than hell can. Cain provides the cold, hard facts in Thank You, Vatican Two! John Gregory has provided the Haydock Commentary for Pentecost Sunday in which Christ makes good on His Promise. He has sent His Spirit, the Paraclete, and, Deo gratias, things will never be the same again for His holy Church is officially off and running in fulfilling His command to His disciples to preach the Gospel to all. Peace He has given them to spread not as the world perceives it even today when humanism is trumpeted from the highest echelons of the conciliarists and scandal is accepted as if it's part of Catholic truth as millions of souls are deceived daily and fall deeper into the miasma that engulfs the lukewarm. We must return to what our Lord taught and what His chosen apostles preached without compromise. Peace is only possible when grace flows. Only then can the Sanctifier reach souls. When God withdraws His graces and blessings, corruption and corrosion follow and all man-made institutions will crumble because they are not of divine design. For the Haydock Commentary of WhitSunday's Epistle and Gospel, see "He will teach you all things." Saint Bede the Venerable was one of the most astute tender of details of those elevated to the exalted status of Doctors of the Church. He was the illustrious ornament of the Anglo-Saxon Church and its first historian. Considered the Father of English History, he was the first to date events as in the "Year of Our Lord" - Anno Domini (A.D.) and would be appalled today to hear that the Modernist secularists want to do away with any reference to Christ whatsoever, all part of the anti-Catholic agenda to de-Christianize America thoroughly. That is the Masonic creed which Bede would never have stood for. This man was one of the few among saints to be termed "Venerable" and he was officially named a Doctor of the Church by Pope Leo XIII. Considered a Father of the Church, this man is one of the few among the saints who is called Venerable. He was the Benedictines' jewel this Holy Historian. John Gregory has provided the Haydock Commentary for the Sunday within the Octave of the Ascension and it is most appropriate considering the apostasy so prevalent in Rome. In all things Christ must be honored and defended even if it means being persecuted for believing in Him. Our Lord conveys these final words to His disciples, foretelling of a time when the Jews and unbelievers would greatly harass and even kill them. Every apostle except for St. John suffered martyrdom. When Jesus speaks of His followers "being put out of the synagogues" what do you think they'd have to say about BeneRatz' latest schmoozing and giving credence to Caiaphas and all the faithless Jews since who persist in their error? What does he do? Not only participates, thus publicly giving scandal through his persistent heresy, but proclaims that the Jews do not need to be converted. But then what's new? In fact, he's done it so much that few recognize the apostasy in their midst. We need only read what our Lord says about it in today's Gospel. Do you think Fr. Joseph Ratzinger has read that passage? Do you really think he cares? Ah, there's the rub. All hail man! Yes, Lord, we remember that You did tell us this too would come. Perhaps we never realized how bad it would be with so many duped into actually believing Ratzinger represents You. St. Paul says today "in all things God may be honored through Jesus Christ", not man. For the Haydock Commentary of Sunday's Epistle and Gospel, see "They have not known the Father, nor Me." Yes, these are frightening times but we can take heart from the "Apostle of Tradition" Saint Athanasius who, in the time of the Arian heresy which pales in comparison to the heresies abounding today, stated, "They can occupy our churches, but they are outside the true Faith. You remain outside the places of worship, but the Faith dwells within you. Let us consider: what is more important, the place or the Faith? The true Faith, obviously. Who has lost and who has won in this struggle - the one who keeps the premises or the one who keeps the Faith? 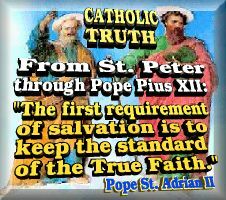 Even if Catholics who remain faithful to the Traditions are reduced to a handful, they are the ones who are the true Church of Jesus Christ." Gary Morella weighs in with what Catholics need to believe and act on considering how fast America is losing her soul. Things are happening so fast and furious that legislation, such that will bankrupt future generations, has been passed by those who should be representing the people but definitely do not for they did not even read and examine the dangerous and immoral 790 billion dollar porculus spendulus bill that will only stimulate satan and his legions. Yet the Demoncrats and three RINOs brazenly put their approval on what for many will be their death warrant. God will not forget nor shall we for unjust laws are no laws as His Eminence St. Robert Bellarmine asserted during the time of Trent. So also today. If one is Catholic, then one must act as a Catholic in every way. Not to do so is to be in satan's camp. Gary explains in his no-nonsense piece de resistance Resist Now or Rue it! 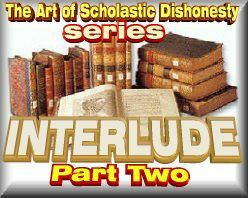 The time has arrived to present closing arguments in the case against Feeneyism and the Treatise and Griff is prepared with over one hundred and forty incriminating exhibits that render those accused of scholastic dishonesty guilty as charged. As we illustrated over a year and a half ago, the flies have not learned. Now they are caught in the web - a web of deceit. Seemingly nothing can save the SSPX as they flounder away in the sticky, sunken schismatic silk trap woven by the counterfeit church of conciliarism. Memo to Bishop Fellay: Don't say you weren't warned! For long the catechism has been the vehicle for explaining the holy Faith, laying out the tenets in understandable language. No where does the Catechism ever deny Baptism of Blood or Baptism of Desire, thus leaving the Feeneyites with empty pages for their arguments. Perseverance and Prayer, with a lot of Penance is our only alternative to surviving the onslaught of the devil for the ranks of the Resistance are thinning thanks to the SSPX hoisting the white flag of surrender. Though we have not come close to even the minimum funds needed to stay on line, mainly because so few have responded, we have a reprieve to publish at least one more month. Thus, despite the feeble response to this traditional apostolate's plea It is the Eleventh Hour. Now it all depends on You!, The DailyCatholic still has a pulse, but barely. Editor Michael Cain explains the status and then weighs in on how it would seem the devil is winning with so many events portending bad omens for true Catholics from Obamamania that is running amok as the country is being run askew to the deaths of two devoted traditional priests - one Fr. Eldred Leslie, a missionary ordained by Archbishop Lefebvre, was murdered by a slacker in South Africa - to the apparent sellout to the usurper 'pope' by Bishop Bernard Fellay of the Society, which the Archbishop founded, and the thousands of Catholics who had resisted the conciliar concessions. Cain wonders aloud what happens to them and how do we welcome those who will be given the grace to see the error of such folly and will flee the SSPX. What shall we do when Obama's naturalistic nihilistic and socialistic reforms are revealed for what they are: Marxism? What shall we do when persecutions intensify against Christians, and they most certainly will, especially traditional Catholics who will be the first to be labeled 'hate mongers' because they love Our Lord Jesus Christ more than anyone or anything else and will not compromise their Faith for anything? He asks these and more questions in his editorial Now What? The Dead Theologians Society are very much alive in their doctrinal accordance and they weigh in with living proof that overwhelmingly favors Baptism of Blood and Baptism of Desire as being in total union with the First Dogma Extra Ecclesiam Nulla Salus. We've been incommunicado for the past two weeks. Why? That's what the editor of The DailyCatholic and Executive Director of SANCTUS Michael Cain explains in a heartfelt last chance plea to save this publication. The recession has hit charities hard and SANCTUS is definitely not immune as he documents. Because of the necessity of our plea and because we have not had internet connection for e-mail or phone since December 31, we are running only this one article and pray it gets wide play and a generous response. If not, say sayonara to The DailyCatholic. That's how crucial the situation is. This time during the month of January is crunch time. It will give evidence how sincere Traditional Catholics really are. There are many Novus Ordinarians who would love to see us close up shop. Do you really want to see conciliar Modernists gloat? Think about such a scenario as these barbarian 'bishops' continue to close down only the traditional churches and take glee in trashing/selling sacred statues and sacramentals. Please tell us that Traditional Catholics truly do care and are charitable with their time, talents and treasures. Please tell us that Traditional Catholics are not miserly and apathetic. Please show us you care! Yes, we are in tough economic times, but have you ever thought the reason we are is because so many have hoarded their money instead of helping those working in God's vineyard? Well, the time has come that a decision must be made. For the answers, see Cain's editorial It is the Eleventh Hour. Now it all depends on You! This special feature is provided by John Gregory with the Haydock Commentary found at the bottom of each page of the Douay-Rheims Bible. With the type so small in most bibles, we publish it here in larger type in conjunction with the Epistle and Gospel for the Sunday Mass with the cogent comprehensive Catholic Commentary penned by Father George Leo Haydock on the Douay-Rheims version of the New Testament. The commentary for the Fourth Sunday of Advent lays out the expectations of the great Light in the darkness Who will redeem man as has been foretold with the immediate precursor of the Messias being St. John the Baptist proclaiming the Lord by being the Voice of one crying in the wilderness in fulfilling the prophecy of Isaias that "all flesh shall see salvation" by alerting the world to pray and repent, to "make straight His paths." A manifestation that God depends on man for cooperation in abiding by His holy will as can be seen in this Sunday's Commentary "Make Straight His Paths"
Until now ignorance may have been bliss, but in weighing all the evidence, we can see the consequences of continuing to acknowledge a known, blatant heretic as being in union with Christ and His Church. In the midst of Advent we take time to rejoice as we say several times during the holy Sacrifice of the Mass Gaudete; something that gives us hope just as it inflamed the hearts of those hearing St. John the Baptist to repent for the Lord was nigh. The tragic journey of a good priest who thought outside the box and, by his stubborn pride, found himself and his followers outside the Church even though ironically that is what he fought so hard to defend, but never to Christ's true Authority on earth. Today the darkness grows ever stronger, the unholy roam the earth, chaos has snuffed out the calm, the brightness of the True Light has been greatly dimmed. What will you do to keep the Light shining? The inmates are running the asylum with no authoritive power. We have the blind leading the blind. Where is the rage of those on watch? Where is our outrage? Cyndi Cain returns with another lesson, this one on the energy problem. No, not oil, or alternative energy but rather the only energy that counts. She's talking about the energy to fuel our souls to conduct the True Light to others. Too many sources are draining that energy because we have allowed it to infringe on our spiritual conduits, on our power supplies of sacrifice and virtue. The world, the flesh and the devil with the help of the conciliar compromisers have sapped so many souls of the Light above that a great darkness creeps steadily and stealthily in from below, engulfing so many clinging to the shadows of political correctness and complacency. Lukewarmness on the right only feeds the frenzy of the radicals to snuff out all sense of decency and goodness, all sense of goodness and grandeur, all sense of the sacred and sublime. St. Ambrose encountered the same plight over fifteen centuries ago for he faced similiar erosion of morals, of the faith and of an epicurean endeavor to embrace the world, albeit, not as widespread and ensconsed as today, perhaps not as perverse either, but definitely authored by the same angel of light who refused to shine. Now it is our turn. Will we also refuse? Or will we answer God's call? His call to Rage, Rage Against the Dying of the True Light. What we need today are men with the backbone of St. Ambrose to stand against the usurpers, to cry out "You are false shepherds, begone! Bring back the true Faith to the starving, depleted, scattered flocks." He was a unifier. Is there anyone who will step forward and truly unite Catholics once more against the heresies so rampant today? Today, besides being the Vigil of the Immaculate Conception and Second Sunday of Advent superseding the normal vigil day of fast and abstinence, it is the Double Feast of the Holy Doctor of the Church Saint Ambrose. Ambrose was the first to migrate from the north, the Rhineland area of Trier and settled in Milan, Italy where he cast away a lucrative career as a lawyer and politician to accept the people's acclaim as their Bishop. He ruled in holiness and justice and was responsible for converting and nurturing Saint Augustine among thousands of converts. Together they fought vigorously against the Arian heresy towards the end of the 4th century. Unlike the pansy 'bishops' of today, Ambrose stood strong against the heretics and even the emperor for he was not ashamed of proclaiming Christ's truths nor was he afraid of offending anyone if they offended God. This pagan-born saint is known as Saint Ambrose "Converter of Saints"
John Gregory has provided Father Leo George Haydock's cogent comprehensive Catholic Commentary on the Douay-Rheims version of the New Testament. The commentary for the Second Sunday of Advent expresses hope for all in both the Epistle where St. Paul speaks of patience in persevering for Christ and in the Gospel our Lord manifests to the Baptist's disciples that Jesus is indeed the Messias Whom John the Baptist has strived to make way the path for. Christ proves this through the prophecies of the Old Testament, specifically the prophet Isaias who foretold the "Root of Jesse" and affirming St. John the Baptist as a prophet as the immediate Precursor of the Messias. In fact, Our Lord reveals that His cousin in prison is "More Than a Prophet"
Stubbornness is a trait born of pride often found in cults who refuse to believe their leader is all wet, totally off track. Such is the case with the cult of Feeneyism entrenched at the St. Benedict Center which was founded by Fr. Feeney as ground zero and carried out in defiance of Eternal Rome's warnings to cease and desist. In their disobedience they ceased being "slaves of Mary" and became slaves of heresy.